I may have preferred rawness and punky energy in Nihilistinen Barbaarisuus debut Synkka Tuuli, but their subsequent single Vainamoinen indicated the band was not going to remain stagnant, and the new full-length The Child Must Die, of which Vainamoinen is a part, proved it. No longer just about being raw ambient-toned black metal, The Child Must Die demonstrates a level of emerging maturity for the band, where they mix adherence to the basic tenets of the genre, a weird sense of clarity, symphonic synth of early Emperor and Dimmu Borgir, some Nordic feeling, some melodic Children of Bodom thrash, and call everything their own. 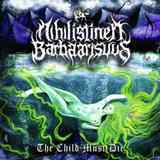 Vainamoinen may have announced the arrival of the new era for Nihilistinen Barbaarisuus, and this composition is one of many on The Child Must Die which profess that in the short two years which passed since Synkka Tuuli the band has completely morphed into a vastly different entity. Just comparing the squashed production of Synkka Tuuli and the vast clearer sound of The Child Must Die confirms the point. Opener Wondrous Sampo plunges right in, and immediately establishes this drilling sideways unsettling feeling. Wondrous Sampo and Let Them Perish, with its shrill foreground synth, the opening march towards steady blasting and shrouding melody, are pretty disturbing pieces. They are pretty cathartic in nature, mental patient symphonies, Let Them Perish even reminding me of simpler Aborym, where the emergency siren solo fits and dark piano finish nails it. Barking voice, supported by what seems like cleaner in tone, but still plenty raw chorus, shows that there is more than one person occupying Nihilistinen Barbaarisuus asylum. If the band does not focus much on intros, as I mentioned they don’t fool around and grab it by the jugular from the opening seconds of The Child Must Die, they are definitely big on outros. As much as the piano in Let Them Perish is the final nail in the coffin, the frozen beautiful closure of Feast of the North Farm elevates this folky piece threaded around simpler almost Moscow Nights melody. There are also some aggressive straightforward blasting songs, Amidst the Waves and the title track, after the latter gets over its brooding mood, the notes played there later echoed in the closer The Night She Died (I have a gut feeling there is a connection between the two, but can’t quite know what it is). The Child Must Die shows that Nihilistinen Barbaarisuus have evolved into a band that took its start in some US/Finnish dungeon, yet it has progressed to acquire some disquieting qualities along the way, elevated its stature, and I am sure the band would not mind it this way.